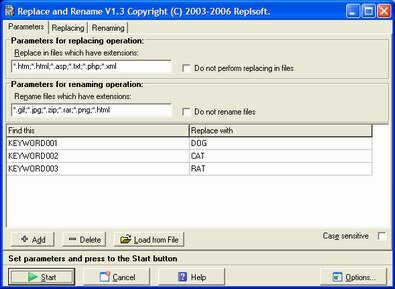 Replace and Rename allows you to perform both file renaming AND text replacing in one easy batch file from one "keyword" import file. Replace and Rename allows you to perform both file renaming AND text replacing in one easy batch file from one "keyword" import file. The software works with files from directories and subdirectories. All you need is to select a directory (or directories) with the files you would like to process.